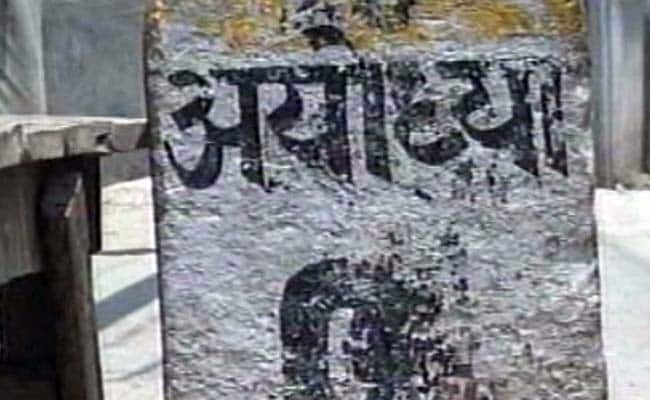 The Uttar Pradesh Shia Central Waqf Board had yesterday hammered out an agreement with the Akhil Bharatiya Akhada Parishad on the Ram temple-Babri Masjid issue which will be submitted to the Supreme Court soon, the leaders of both the organisations had said. Lucknow: The Uttar Pradesh Shia Central Waqf Board (UPSCWB) released today the front page cover of what it claimed was a draft proposal that would amicably settle the Ayodhya dispute. "We have issued the front page of the draft proposal to amicably settle the long pending Ayodhya dispute," UPSCWB Chairman Wasim Rizvi said here. The front page had the title "Ek rasta Ekta ki oor" (A way towards unity) written on it with pictures of the proposed Ram temple as well as the Babri mosque, with a Hindu man with 'tilak' on his forehead hugging a Muslim. Mr Rizvi, however, did not elaborate on the contents of the draft saying they would be finalised soon. The UPSCWB had hammered out an agreement with the Akhil Bharatiya Akhada Parishad on the Ram temple-Babri Masjid issue which will be submitted to the Supreme Court soon, the leaders of both the organisations had said. The Supreme Court had on August 11 said it would commence the final hearing in the dispute from December 5. "It has been amicably decided that no new mosque will be built in Ayodhya or Faizabad. The Shia Waqf board will identify a piece of land in a Muslim-dominated area and inform the government," Mr Rizvi had said. The Parishad had objected to the construction of a mosque in Ayodhya or Faizabad. This issue was resolved by UP Shia Waqf Board chief Rizvi during discussions, Parishad chief Narendra Giri had told mediapersons yesterday after a meeting. Ram Janmabhumi Trust president Mahant Nritya Gopal Das was also present in the meeting. The decision will be conveyed to the Supreme Court by December 5, a day before the 25th anniversary of the demolition of the medieval-era structure.